Because of your generosity, our students are able to challenge themselves academically while nourishing their spiritual and ethical development. In our classrooms and laboratories, our students are excelling in their studies as they prepare to enter the workforce. They are engaging in civil discourse as it pertains to challenging issues, contributing to groundbreaking research and developing problem-solving skills. The impact that your support has on our students goes beyond the classroom walls, as our students and faculty members provide service to the Church, the community, the nation and the world. Students have plentiful opportunities to immerse themselves in other cultures-both in Pittsburgh and abroad-as they become more knowledgeable about global concerns and how they can make a difference in our world. 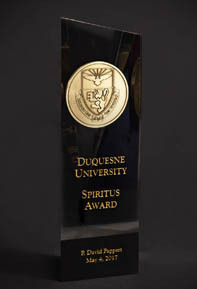 The President's Scholarship Dinner is highlighted by the presentation of the Spiritus Award, to an individual or couple, and the Cor Communitas ("Heart of the Community") Award, to a corporation or foundation, for exceptional leadership in philanthropic support of Duquesne. These awards honor remarkable gifts that have transformed academic programs and students' lives. Meet the 2016 recipients, P. David Pappert and PNC.